Hodgee is a beast of unspecified proportion and unknown origin that makes its home in the murky blue waters of San Diego’s Lake Hodges. Though Hodgee hasn’t quite achieved the worldwide fame of say, Bigfoot, it is a beloved local story. An unofficial mascot, even. Lake Hodges is a 1,234-acre reservoir that provides much-needed water to arid San Diego County. It’s also a popular destination for fishing, hiking and a number of other outdoor activities. And now, at the northernmost tip of the lake, stands a two-story statue of Lake Hodges’ eponymous beast. The sculpture, carved over the past few months from a eucalyptus tree, serves as a fun homage to the unofficial mascot of Lake Hodges. Like Bigfoot and the Loch Ness Monster, Hodgee is a cryptozoological beast that makes its home in the reservoir. 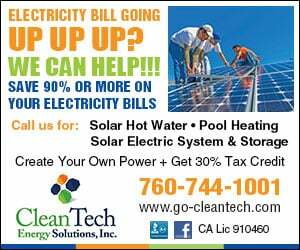 “I think it’s absolutely terrific,” said Del Dios resident Renee Richetts. “It’s the essence of public art.” Richetts is herself a sculptor, with work on display in a room of the Escondido Arts Partnership Municipal Gallery, called “Richetts’ Space.” She was admiring the nearly completed sculpture with her grandchildren. Richetts explained that the city intended on cutting the massive eucalyptus down, when the top half had been stricken with a disease. “It was going to kill someone,” Richetts said. The Del Dios Town council stepped in and voted that, instead of taking the tree down completely, they remove the top half, which was the diseased part, and make something of the rest. That “something” became a friendly, 20-foot-tall creature. A pair of local artists stepped up, volunteering their time and their craft to recycling the towering tree into something that will last forever. Ewing “Mitch” Mitchell and Stan Smith are both to thank for the sculpture. As is often the case with cryptozoological beasts, origin stories can vary. Richetts explained that the legend of Hodgee, as she heard it, stems from the silhouette of the lake itself. In years past, when the lake contained more water, the outline of Lake Hodges resembled a water-dwelling dinosaur, possibly a pilosaurus. Lake Hodges is the main attraction, but there are plenty of reasons to seek out this community. There are miles of hiking trails. There’s the Rattlesnake Viewing Platform, overlooking the Lake Hodges Dam, and of course, there’s Hernandez Hideaway — the place to eat when you visit. 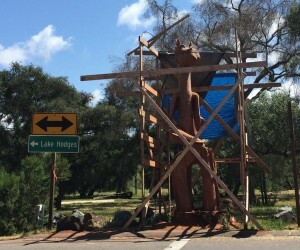 The creature, still ensconced in 2×4 scaffolding, stands vigilant at the intersection of Date and Lake, its kindly face welcoming visitors to Del Dios Community Park, and the lakeside hamlet itself. The statue, like the story itself, is just one more reason to visit this quaint little pocket of San Diego County. The existence of an elusive creature below the lake’s surface is a fun story, and just like Bigfoot, Champ and Nessie, belief is a matter of faith, and responses vary from person to person. Richetts, for one, believes. “Of course I believe in Hodgee,” she said. “Since the very first time I set eyes on her!” But with this new statue, there’s now a public face to Hodgee, above the water and out on the open, for everyone to enjoy. So: Could there be a Lake Hodges monster, gliding along just under the surface, just out of sight? Barring any documented physical evidence (Hodgee poking his head out for a photo, for example), it’s ultimately a matter of faith — she’s real, if you want her to be.